George Graham Reviews Robben Ford's "The Authorized Bootleg"
Last week, we featured an album by Monte Montgomery whose instrumental focus some might consider an oxymoron, acoustic rock. This week, we coincidentally have another album spotlighting the acoustic guitar in a band setting playing another style that some might not associate with the instrument, the blues. Many blues fans who are relatively new to the genre automatically associate the blues the hard-driving electric style pioneered in the 1950s in Chicago and adopted by two generations of rock-influenced players, but the blues of course started on acoustic guitar, as can be heard in the historic recordings of Robert Johnson and others, and leading up to artists like Sonny Terry and Brownie McGhee, Taj Mahal and Keb' Mo' today. But most acoustic blues tends to be solo or without a rhythm section. The blues and jazz have also been intertwined almost from the beginning, with every jazz musician worth his salt being able to serve up a blues-based tune and do interesting things with it. But this week we have a CD that is a bit out of the ordinary: an jazz-influenced blues album on acoustic guitar with a band. Making it more distinctive is the fact that it is a live recording by guitarist well-known as a first-rate electric player and studio musician. 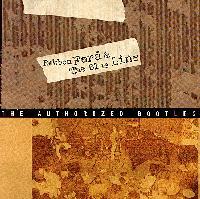 It's called The Authorized Bootleg by Robben Ford and the Blue Line. Robben Ford has had a busy and diverse career going back to his teens when he joined a band with his two brothers, drummer Patrick and harmonica player Mark in a group named after their father, The Charles Ford Band. Robben and Patrick were enlisted to be part of Charlie Musselwhite's band, and there soon followed stints with blues and jazz singer Jimmy Witherspoon, and then a turn toward the sound with which Robben Ford was long associated, jazz-rock fusion, as a member of the L.A. Express with Tom Scott, which backed Joni Mitchell on several albums. Ford also was enlisted by George Harrison for his Dark Horse LP and also toured with Miles Davis in the mid 1980s. Ford and his long-time friend whom he met working with Jimmy Witherspoon, keyboard man Russell Ferrante were co-founders of what would become the innovative fusion group The Yellowjackets. In fact, Ford's first solo album in 1979, Inside Story was essentially the first Yellowjackets release. After establishing a reputation as a jazzy fusion player, shortly after leaving Miles Davis in 1987, Ford decided to plunge back into his first love, the blues, with a highly-regarded album called Talk to Your Daughter. Through intermittent releases, Ford has been keeping his group The Blue Line, with bassist Roscoe Beck and drummer Tom Brechtlein, in the public eye, though his last regular studio album from last year, Tiger Walk put him back in the instrumental fusion category once again. In the meantime, with increasing numbers of Ford fans, especially among guitarists and would-be pickers, some older recordings have been either released for the first time or re-released, including a live date with Jimmy Witherspoon and a concert recording with Ford's own group from 1972, when he was only 21. Now Ford is out with a more current live album, though it consists of a performance given in December of 1995 in Oakland, California. The name, by the way, The Authorized Bootleg was inspired by Ford's annoyance at the circulation of poor-quality bootleg concert recordings of his group. As mentioned, this is an interesting departure for Ford, who is rarely heard on acoustic guitar. The concert was a noontime affair given at Yoshi's jazz club in Oakland, in which mostly material previously recorded by Ford and the Blue Line is given a new treatment. Ford is joined by the long-time members of the Blue Line, bassist Roscoe Beck and drummer Tom Brechtlein, who also gained notoriety as a member of one of Chick Corea's fusion bands, and pianist Bill Boublitz, who has also been heard on previous Ford albums. The feel is relaxed, and the audience quite receptive to the music in this event which was originally a live radio broadcast. Ford underscores the truism that the best guitarists will sound good an any variety of the instrument. And the acoustic guitar is the true test of a player, who cannot hide behind the amplification, electronic effects and or the artificial sustain that the electric instrument affords. As a result, Ford serves up some very tasteful playing, as does the entire group, who lays back on the volume in favor of classy musicianship. His vocals are typically appealing in his relaxed, airy tenor voice which flies against the gritty baritone blues vocal stereotype. Beck plays an upright electric bass, Boublitz a grand piano and Brechtlein often plays his drums with brushes. Robben Ford and the Blue Line, on their newly released CD The Authorized Bootleg, recorded in performance about two-and-a-half years ago, shows another facet of a consistently notable guitarist, known for his work in both jazz-rock fusion and blues, in which he played electric guitar almost exclusively. This relaxed acoustic performance shows him in fine form minus the amplification and all that brings to the guitar, and puts his playing very much on the line. The result, as one might expect from such a consistently fine guitar player is first-rate. They may be some who argue about the album's blues authenticity, but the quality of the musicianship makes such concerns a bit pointless. It's just good music, tastefully performed with an especially appealing live ambience. Sonically, the album is a class act. For a live recording, the sound makes relatively little sacrifice compared to the technical standards of the studio. Ford's guitar sound comes from the internal pickup on the guitar, rather than being miked from the body of the instrument, so the acoustic guitar has a somewhat metallic quality in sound. But that is to be expected in a live setting. Notable is the album's very good dynamic range. The soft portions of the music are allowed to remain that way, and not compressed to full loudness as is all too often the case on many CDs. Robben Ford and the Blue Line's The Authorized Bootleg is probably of greatest interest to those who are familiar with Ford's past work, and his many fans. But even those encountering this versatile guitarist for the first time will find much to enjoy on this CD of eclectic jazzy acoustic blues rock. (c) Copyright 1998 George D. Graham All rights reseved.